I enjoy many things about Peter Jackson’s Hobbit films – the material realization of various Middle-earth cultures, the creation of the best movie dragon I’ve ever seen, Martin Freeman’s Bilbo, to name only a few – but of course Jackson is not making the films specifically for me, a medievalist with a love of Tolkien’s work. As such, I had hoped that Jackson would have given us a resonant scene focusing on an uncle and his nephews — Thorin, Fili, and Kili — making their heroic last stand in battle together. There is a long tradition of the special relationship between “sister-sons” and their uncles in medieval literature that Tolkien refers to in The Hobbit. Working out that relationship to its traditional end would have inserted Jackson’s scene more firmly in a body of stories about these deeply embedded emotional relationships that are a part of western Europe’s cultural history. Now wait a minute, you might be saying to yourself. Jackson  clearly indicates a strong relationship between Thorin and his nephews, and their death scenes in The Battle of the Five Armies are somewhat connected and set apart from others. Yes, but not exactly in the traditional way I’m talking about. In The Hobbit, Tolkien simply reports, “Of the twelve companions of Thorin, ten remained. Fili and Kili had fallen defending him with shield and body, for he was their mother’s elder brother.” (“The Return Journey,” The Hobbit 268). Yes, they defend each other because they’re family, but more specifically because Fili and Kili are Thorin’s “sister-sons” (sweostor sunu in Old English). not far did he fall from friend and master. So what does Jackson do with the uncle-nephew bond? In The Battle of the Five Armies, Thorin welcomes Fili and Kili to the kingdom of Erebor, addressing them as his “sister’s sons.” In Jackson’s movies the young dwarves Fili and Kili refer to Thorin as their uncle, and in The Desolation of Smaug Thorin tells Fili that one day he will be king. In The Battle of the Five Armies, when Thorin finally bursts out of the mountain gate to join the battle, the two warriors running closest to him on either side are Fili and Kili. In their last fight, Thorin calls Dwalin, Fili, and Kili to go with him in an attempt to take down Azog. Gandalf comments that Thorin is taking his best fighters with him. In Old English they would be called his heorð-geneatas, his “hearth-companions,” a small group of noble, well-trained fighters who are closest to their lord, and it is reasonable to think that the young and courageous nephews would be among them. Fili and Kili, then, are appropriately represented as sister-sons in most of Jackson’s Hobbit. But the uncle-nephew bond dissipates in their final scenes. While Tolkien recognizes in “The Homecoming” that “ever near shall be at need nephew to uncle,” in The Battle of the Five Armies the nephews end up nowhere near their uncle in a time of need. Instead, Thorin sends Fili and Kili away to hunt for Azog, and then the two nephews split up in separate searches as well. Fili is killed in the sight of both of his kinsmen (we don’t see him fighting heroically to the end; he’s just skewered and then thrown over a cliff) but both Thorin and Kili are too far away to do anything about that attack. Uncle and nephew cannot stand and defend each other. The killing of Fili enrages Kili, who runs off in a passionate Orc-killing spree, but his end is complicated by the arrival of Tauriel. Now, I have to make clear that I do not object in principle to the creation of new characters like Tauriel. But her involvement in Kili’s last fight obscures the uncle-nephew bond that defines Thorin and his sister-sons. Instead of Thorin, Fili, and Kili fighting side-by-side until they are cut down, we get a different trio: Kili-Tauriel-Legolas defending each other. 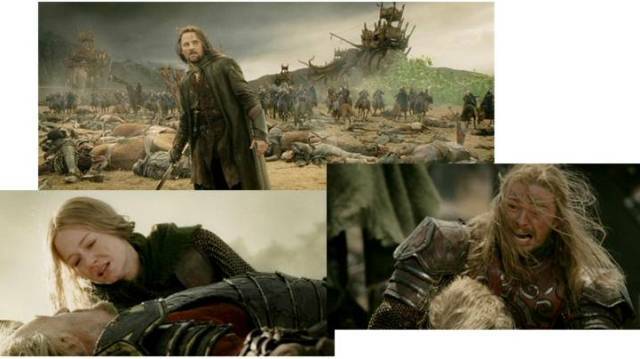 Kili’s last look is not to his uncle but to Tauriel; his uncle is too far away to be part of the scene. The special bond of an uncle with his nephews who “had fallen defending him with shield and body,” is nowhere to be seen. Peter Jackson knows how to film emotional battle scenes, as he demonstrated in The Return of the King: sweeping music, slow motion, the melee of battle, the depiction of personal anguish. Had Jackson completed the Hobbit story with a heroic last stand of uncle and nephews fighting side-by-side on the battlefield, their tale would have participated in a long tradition of sister-son stories and allowed us to feel the emotional impact of that relationship in a visceral way. Thorin, Kili. Lisa’s Video Frame Capture Library. The Hobbit: trailers. Image 326. Too bad the opportunity was lost so close to the end of the movie. These uncle-nephew relationships are important in other cultures beyond the European, but I am only familiar with the northern European literary uncle-nephew motif. It is likely that the practice of fostering high-born children – having a son educated in his uncle’s home, for example – contributed to the motif in medieval literature. I use “Jackson” throughout as shorthand. Although he was the director of the Hobbit movies, he was not the only writer. The full writing team consists of Peter Jackson, Philippa Boyens, Fran Walsh, and Guillermo del Toro, who gets a writing credit for his involvement with the project in its earlier stages. Tolkien inserted this line about Fili and Kili dying in defense of their uncle late in the process of composition. According to John Rateliff: “The idea that the two most likeable of all Bilbo’s companions should also die in the battle…first appears in the continuation of the typescript that eventually (autumn 1936) replaced the Third Phase manuscript” (684, n. 11). Rateliff also points out that Thorin was originally Fili and Kili’s great-uncle, but Tolkien later moved him one generation closer. (See, for example, Rateliff 444 – 445, note 11). In Appendix A of The Lord of the Rings, in the section on “Durin’s Folk,” Thorin appears in the genealogy as Fili and Kili’s uncle (1418). Verlyn Flieger discusses the Bilbo-Frodo kinship in the light of the uncle-nephew motif in her essay, “Frodo and Aragorn: The Concept of the Hero.” The essay has been reprinted in a couple of places, including Flieger’s collected essays in Green Suns and Faërie: Essays on J.R.R. Tolkien. Kent State University Press, 2012 and in the 2004 volume, Understanding the Lord of the Rings: The Best of Tolkien Criticism, edited by Rose A. Zimbardo and Neil D. Isaacs, published by Houghton Mifflin and partly available as a Google e-book. Rateliff comments on the line of succession in Tolkien’s conception of the Dwarves’ patriarchal line of kings which excludes the maternal nephews (704). In the early Middle Ages, young relatives in the maternal line might succeed a ruler; it is interesting that in this detail Jackson is closer to early medieval practice than the book. Flieger, Verlyn. “Frodo and Aragorn: The Concept of the Hero.” Green Suns and Faërie: Essays on J.R.R. Tolkien. Kent State University Press, 2012. 141-58. Print. Also available in Understanding The Lord of the Rings: The Best of Tolkien Criticism. Ed. Rose A. Zimbardo and Neil D. Isaacs. Boston: Houghton Mifflin, 2004. 122-45. Print and Google e-book. Jackson, Peter, dir. The Battle of the Five Armies. New Line Cinema, 2014. Film. ____. The Desolation of Smaug. New Line Cinema, 2013. Film. Klaeber’s Beowulf. Ed. R.D. Fulk, Robert E. Bjork, and John D. Niles. 4th ed. Toronto: U of Toronto P, 2009. Print. Rateliff, John D. The History of the Hobbit. 2 Vols. Boston and New York: Houghton Mifflin, 2007. Print. “The Battle of Maldon: Hypertext Edition.” Old English Literature: A Hypertext Course Pack. English Faculty, Oxford. 2009. Web. 14 Jan. 2015. “The Lord of the Rings: The Hobbit: An Unexpected Journey.” Lisa’s Video Frame Capture Library. 2 Oct. 2014. Screenshots. 14 Jan. 2015. “The Lord of the Rings: The Hobbit: Trailers.” Lisa’s Video Frame Capture Library. Jul – Nov 2014. Screenshots. 14 Jan. 2015. “The Lord of the Rings: The Return of the King.” Lisa’s Video Frame Capture Library. n.d. Screenshots. 14 Jan. 2015. “Thorin, Fili and Kili Banner in Super High-Resolution.” TheOneRing.net. 22 Nov. 2014. JPEG. 14 Jan. 2015. Tolkien, J.R.R. “Durin’s Folk.” Appendix A.iii. Return of the King, being the third part of The Lord of the Rings. London: HarperCollins, 2007. 1406-19. Print. _____. The Hobbit, or There and Back Again. London: HarperCollins, 1999. Print. _____. “The Homecoming of Beorhtnoth Beorhthelm’s Son.” Tree and Leaf, including the poem Mythopoeia. London: HarperCollins, 2001. Print. MLA citation of this post: Smol, Anna. “Jackson’s Lost Opportunity: The Death of Sister-Sons.” A Single Leaf. 16 Jan 2015. Web. [insert date of access here without brackets]. What did you think of these final scenes in the film? Any other examples of sister-sons that you want to discuss or add? Please feel free to comment!